From the moment you step on our lot until the time you drive away in your next vehicle, your buying experience with Smiley Automotive is our number one priority. We appreciate the opportunity to earn your business, from those buying a $1,000 vehicle to those buying a $100,000 vehicle, we will treat you as you are family and help out anyway we can to earn your business. We encourage you to use the expertise and resources of our sales staff; they are here to help you find the right vehicle at the right price. If it is to set up an appointment to test drive a vehicle we currently have or if we can locate the vehicle of your dreams, we can make it happen. With one easy call/text or filling out the contact us form above, we will make your car buying experience simple. Call today to let us start earning your business the Smiley way 419-663-2277 Norwalk main location or 567-805-4137 Norwalk South location by Fisher Titus Hospital. Smiley Automotive Making Car Buying Simple For Over A Decade. Jim has been in the automotive industry for over 25 years. Before that he played minor league baseball for the Cincinnati Reds and he still has a mean fastball. He has 4 children, his little princess Kami, Alex his youngest super star athlete son, his Capital University graduate and 4 year athlete Ryan, and his hardest working oldest son Justin. Four years ago his oldest son Justin gave Jim his pride and joy grandson Layne Neuberger. His true love is watching his kids grow and participating in sporting events at Edison High School while hanging out in the bleachers with his little buddy Layne. Jim is also involved with the local 4-H programs helping local young boys and girls with learning how to take care of farm animals and understanding the importance of agriculture. He has been with Smiley Automotive ever since we opened the doors in 2005 and his reason for striving for perfection is simple, he loves taking care of customers and making their dreams come true. Jim is an absolute amazing person and team leader that will do everything in his power to help his team and his customers in any way he can. Chas has been with Smiley Automotive for over 9 years. While working for the family business he commuted to BGSU Firelands for 2 years and then BGSU Main Campus for 2 years to further his education in the business world. After BGSU he came back to the company with a strive to grow the family business, working under the wings of his father Jeff Smiley and great friend Jim Neuberger. From detailing cars, turning wrenches, to sales, and taking the reigns of the dealerships. He has learned every aspect of the company to better understand every position and why everyone plays a very important role in making Smiley Automotive #1 in not only customer support but company growth. Chas spends his free time hanging out with his best friend and son, Aidin Smiley and his beautiful wife, Krystale Smiley. He loves the outdoors, cars, country music and just enjoying the simple things in life like those that matter the most, his family, and his Camaro. His reasoning for continuing his career at Smiley Automotive is simple, he likes putting a smile on each and every customers face while making their dreams come true. One of the largest purchases a person will make in their life is their automobile and he feels honored when people allow him the opportunity to earn their business. Dave has been in the car business for over 15 years and has been a part of the Smiley Automotive team for 5 years now. Dave does a spectacular job at being a Finance Manager by going above and beyond when it comes to helping customers. Without asking, he steps up to help his customers, not only financing their vehicles but figuring out past financial issues hanging over their heads and directs them to how to fix certain situations. On his free time Dave enjoys being with his 2 beautiful daughters Reghan and Madison, his son Jarett, and his wonderful wife LaNelle the glue to his amazing family. Dave and his children have accomplished remodeling their old school Camaro together and love racing down the track at Summit Raceway Park. His love for helping people is the #1 reason for staying with Smiley Automotive. He puts his heart and soul into helping anyone and everyone accomplish their goals with making their dreams come true, because it is the right thing to do. Larry has been a part of the Smiley Automotive team for over 5 years now. Before joining the team he was a coach for Western Reserve Roughriders, and worked at Tenneco in Milan. Larry was born in California but moved to Ohio with his family when he was in the 4th grade and has been a local resident ever since. In his spare time Larry enjoys spending time with his amazing wife Sarah, beautiful daughter Brooke, and college graduate son Blake. He loves being able to spend time with his family and friends at church and outdoors hunting and fishing where he can teach his children the things his father taught him. Larry enjoys helping others by coaching the young athletes in track and football along with helping out those in need with donating his time to local charities and events. Mr. Buckhannon fits in great with the team here because of his hard work and dedication to go above and beyond to help those in need. "Selling from his heart and not his wallet and the good Lord will take care of you" has been Larry's motto ever since working here because he knows if he does what is right the good Lord will take care of him. Jarett has been with our team for a few months now but has been learning the business his entire life from his father Dave Williams. Jarett has always been interested in the car business after watching his dad help thousands of people over the years get into the car of their dreams. Jarett grew up in New London Ohio and graduated from New London High School in 2017. On his free time Jarett enjoys spending time with his family and friends along with building his race car that he races at Norwalk Raceway Park. Helping others is something that comes easy to Jarett because he truly enjoys it, from helping others fix their car at the track to helping people get into a nicer newer ride. Monica has been in the automotive industry for about 9 years and has been part of the Smiley Automotive sales team for about 4 years. Prior to this Monica has been in many other sales positions, but car sales has been her favorite and most successful! She spent 8 years in the United States Air Force stationed in California with the Lockhead SR-71 Blackbird, a strategic reconnaissance aircraft. She has 2 sons, Nick & Joe whom she is very proud of! Nick is currently following in her footsteps serving in the Air Force for 10 years now. Nick is currently stationed in Okinawa Japan with his wife Catherine. Joe is living in Norwalk currently pursuing a successful career. In Monica's free time she enjoys just relaxing with friends and family in the "Coziness" of the town of Norwalk. Monica fits in with our team so well because she has one of the biggest hearts and truly enjoys helping people. Selling from her heart and not her billfold comes natural to her because of how much she cares for others. 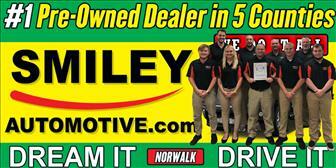 Aly has been part of the Smiley Automotive team for about 2 years. Prior to working with the Smileys, she has managed her own business "Aly's Creations" This is where she makes sweet treats in her bakery from wedding cakes to cookies!! She enjoys attending country music festivals and concerts! From walking her customers through the buying process step by step, to being an extremely helpful individual willing to go the extra mile makes Aly a perfect fit for our Smiley Team. 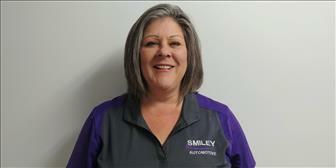 Kassie has been a part of the Smiley Automotive team for over 9 years now. 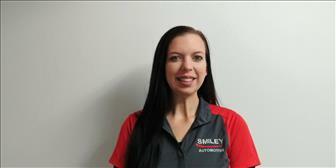 Amie has been with the Smiley Automotive team for two years now. Her and her husband have 2 beautiful kids and she loves spending time with them and being outdoors hiking, fishing and camping. Before joining our team Amie was a stay at home mom raising her children. She enjoys detailing because it gives her the gratification taking a dirty vehicle and making it pristine inside and out. Ed Ritz has been a part of the Smiley team now for over 5 years. Bob has been a part of the Smiley team for almost 7 years now and does an amazing job taking care of our service customers and controlling all of the parts. Carl has been a part of the Smiley Automotive team for over 7 years now. Mike has been with our Service department for almost 1 year now. He is a 28 year ASE Master Technician certified in Chrysler, Ford Master Senior, Volvo Master Senior, and Nissan Master Technician. Mike loves to work on vehicles and really enjoys working here because it gives him the chance to help others the right way and able to do it at a place that doesn't over charge their customers. On his free time he enjoys hunting, fishing, being outdoors or spending time with his wife and 4 children. Thomas Blankinsop has been a part of the Smiley Automotive team for almost 3 years now.